Duane Hanson Sculptures for Sale | Duane Hanson Art Value Price Guide "; var html = item.label.replace(regEx, replaceMask); return jQ("
Invaluable cannot guarantee the accuracy of translations through Google Translate and disclaims any responsibility for inaccurate translations. Description: PolyvinylUSA, 1988Duane Hanson (1925-1996) – American sculptorSigned, titled, inscribed and dated in market on the undersideAccompanied by a copy of a letter and polaroids from the artistDimensions: 9 ¼ x 10 x 5 ½ in. (23.5 x 25.4 x 14 cm. )Very good conditionEstimate $20,000-$30,000ProvenanceGift from the artist to the present owner. Supremely devoted to the human form, Duane Hanson is best known for his hyperreal sculptures of middleclass America. Often using volunteers from his local art community in South Florida as models, Hanson also drew inspiration from his family members. Offered here is a rare study of his one-year old grandson, executed in 1988. The bust of his grandson demonstrates his pursuit and desire to capture a fleeting emotion or transient period of life through his hyperreal sculptures. The result is an immediate and uncanny evocation of a human being, with a purge of artistic effects to create a surrogate for reality. Duane Hanson (American, 1925-1996)Born in Alexandria, Minnesota, Duane Hanson received his MFA from Cranbrook Academy of Arts. Hanson is best known for his lifecast realistic works portraying working-class Americans, associating him with both the Pop Art movement and hyperrealism. His early works comprised life-sized tableaux, while his later sculptures shifted to satirical depictions of everyday people. A survey of Hanson’s work was recently exhibited at the Serpentine Sackler Gallery in London. His works can be found in the collections of numerous institutions, including the Smithsonian American Art Museum, Corcoran Gallery of Art, the Whitney Museum of American Art and the St. Louis Art Museum, among others. ConditionMinor surface dirt and areas of paint loss. Otherwise in excellent condition. Shipping costs excl. statutory VAT and plus 2,5% (+VAT) shipping insurance. Lot 276: DUANE HANSON Sketch Head. Description: DUANE HANSON Sketch Head. Polyvinyl sculpture, 1980. 330x206x228 mm; 13x8x9 inches. Ex-collection William Ray, California. After expressing interest in his work, Ray was invited by Hanson to his studio in Davie, Florida, in the early 1980s. The meeting forged an instant frienship that lasted until Hanson's death in 1996. The artist, described by Ray as being "accessible, friendly and generous to his students and other artists," gifted the Sketch Head to Ray during a visit to his studio in the early 1980s. Condition Report: All items are offered for sale subject to Swann Galleries' standard terms and conditions of sale, which are published in our catalogues. Condition Report: 1st item: Flagpole sculpture has chip to forehead, breaks/chips to extremity of toes, and a few abrasions to knees. 2nd item: Clean repaired break to head and wrist. Archive materials lightly toned; letters retain original envelopes. 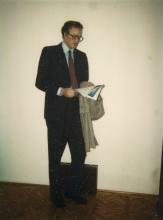 Lot 532: HANSON, DUANE (1925-1996) [Study for Businessman Reading], 1983. Condition Report: Any condition statement is given as a courtesy to a client, is only an opinion and should not be treated as a statement of fact. Doyle New York shall have no responsibility for any error or omission. The absence of a condition statement does not imply that the lot is in perfect condition or completely free from wear and tear, imperfections or the effects of aging. Condition Report: Surface grime; two thin scratches to the right hand; a few small spots of discoloration to the fabric; fading to the blue fabric; minor degradation to the bottle. Description: polyester resin and Fiberglas, polychromed in oil with clothes, table, chair and accessoriesExecuted in 1971.PROVENANCEO. K. Harris Works of Art, New YorkAcquired by the present owner from the above on May 20, 1971 for $3,000EXHIBITEDChicago, Museum of Contemporary Art, Radical Realism, May - June 1971, cat. no. 22New York, O.K. Harris Works of Art, Duane Hanson, January - February 1972Washington, D.C., Smithsonian Institution, on extended loan, 1975-1981Wichita, Edwin A. Ulrich Museum of Art; Lincoln, University of Nebraska Galleries; Des Moines Art Center; Berkeley, University Art Museum; Portland Art Museum; Kansas City, William Rockhill Nelson Gallery and Atkins Museum of Fine Arts; Colorado Springs Fine Arts Center; Richmond, Virginia Museum of Fine Arts; Washington, D. C., Corcoran Gallery of Art; New York, Whitney Museum of American Art, Duane Hanson, October 1976 - April 1978, p. 3, illustrated (artist seated with sculpture) and p. 42, illustratedMadison, Wisconsin, Elvehjem Art Center, on extended loan, 1981-1984Chicago, The David and Alfred Smart Gallery, University of Chicago, on extended loan, 1984-1994Ottawa, National Gallery of Canada, on extended loan, 1994-2005Montreal, Museum of Fine Arts; Fort Worth, Modern Art Museum of Fort Worth, Duane Hanson, February - October 1994, pl. 9, p. 53, illustrated in colorLITERATURE AND REFERENCESGerrit Henry, "The SoHo Snatcher: Duane Hanson", AA News, vol. 71, March 1972, pp. 50 - 51, illustrated in colorIn Domus, no. 525, August 1973, p. 13, illustrated in colorGregory Battcock, ed., Super Realism: A Critical Anthology, New York 1975, p. 209, illustratedThomas Buchsteiner & Otto Letze, eds., Duane Hanson More Than Reality, Ostfildern-Ruit 2001, no. 16, p. 34, illustrated in colorCATALOGUE NOTEDuane Hanson's greatest sculptures have a quiet contemplative mood in which a figure of fascinating literalism inhabits its own corner of reality. As the viewer gazes at the particulars of the figure's clothing, features, accessories and environment, one cannot help a feeling of invasiveness or intrusion, but at the same time, a sharp recognition of each quotidian element. Just as the artist was photographed seated with Woman Eating as if he were about to share her ice cream sundae, we could as easily slip into the figure's reality. Unlike other contemporaries who worked in three dimensional formats within the realm of The New Realism or of Pop Art in the 1960s and early 1970s, Hanson's illusion of literalism was all-encompassing from the props to the figure itself. Claes Oldenburg's sculptures of everyday objects are primarily singular subjects - a piece of food, a dress, a flag, a clothespin, or a mouse - presented to us outside of their context. The closely observed nudes of John de Andrea are fascinating in detail but are similarly figures without context. The work of George Segal is closest to Hanson's in its incorporation of real objects or environments, but his figures are rendered with the artifice of plaster and bronze, abandoning any sense of literalism. Hanson sought total integration within his work, blurring the boundaries between reality and illusionHanson's earliest works of the late 1960s were more aggressive in subject matter, including works of social commentary, such as War (1969) and Race Riot (1969-71), or horrific incident such as Motorcycle Accident (1967). In the 1970s, Hanson's mature figurative work emerged. Implied movement was eliminated as figures are either seated or standing in repose or contemplation. Any overt signs of political commentary or social satire are eliminated or subsumed, and a more introspective, often sadder, mood of isolation predominates, similar to the glimpses of diners in Edward Hopper's Sunlight in Cafeteria. Hopper and Hanson also both opted for portraying "common people" as subjects, but in Hanson's case, the accessories and objects that accompany the figure are more overt signs of social class. From the wing-tipped glasses to her frayed and drab clothing, the Woman Eating is as clearly associated with a certain American milieu as the Supermarket Shopper (1970) with her hair in curlers and her cigarette dangling from her lips, and as the many workers depicted by Hanson from window washers, construction workers, and cleaning women. As Kirk Varnedoe commented, "It is decidedly not the America of mass-market advertising, being neither homey-folksy rural nor urbanely youthful. Hanson's [figures] have been predominantly middle- or lower-middle-class people, belonging to a world of blue-collar service jobs, small business, and diner eating." (Kirk Varnedoe, Duane Hanson, New York 1985, p. 11). In discussing his technique of body-casting for his sculptures, Hanson commented that he often chose heavy set people for their physical impact and presence, and then "I usually portray them as working class types having great dignity, or over-burdened with despair and fatigue due to the complexities of our time." 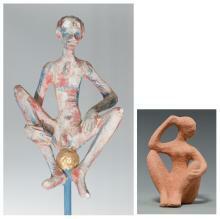 (Ibid., p. 37)Hanson cast his figures from life and his technique became increasingly sophisticated. While body-casting may seem a straightforward and simplistic way to capture a realistic figure, elements of the process actually dictate a great deal of effort and artistry to maintain the sense of literalism. The process for the initial mold-making is not entirely comfortable for the sitter, so a slight sense of awkwardness or artificiality can enter into the pose. The initial molds, done in various sections rather than an entire body cast, are then used to form the vinyl casts which are mixed with tinted paints and paraffin to achieve a more flexible and flesh-like material. The individual parts are put together with hot vinyl and soldering irons, with seams and imperfections melted and smoothed. Careful color and pigmentation applications are a process of great and arduous subtlety, indicating a heightened degree of artistic effort that is mirrored in the careful choice of accessories. The realism of the figure in Woman Eating is mirrored in the infinite details of the crumpled napkin, chocolate covered spoons, crumpled shopping bag and TV Guide and newspaper tabloids. Description: Housewife (Homemaker) oil, fiberglass, hair, fabric, curlers, eyeglasses, armchair, ottoman, suitcase, hairdryer, cup, saucer, cigarettes, slippers and magazines 44 x 35 x 61 in. (111.7 x 88.9 x 155 cm.) Execeuted in 1969-1970. PROVENANCE O.K. Harris, New York Galerie Schmela, Dsseldorf LITERATURE U. Kultermann, Radikaler Realismus, T—bingen, 1972, p. 35 (illustrated). K. Varnedoe, Duane Hanson, New York, 1985, p. 45, no. 4 (illustrated in color). P. Comar, Images of the Body, New York, 1999, p. 51 (illustrated). P. H. Feist, Figur und Objekt: Plastik im 20.Jahrhundert, Leipzig, 1996, p. 234 (illustrated in color). C. Breyhan, Duane Hanson: Housewife: Triumph der Knstlichkeit, Ostfildern-Ruit, 2000, pp. 40, 42-43 (illustrated in color and on the cover). T. Buschsteiner and O. Letze, eds., Duane Hanson: more than reality, Ostfildern-Ruit, 2001, pp. 4 and 28-29 (illustrated in color). B. Kerber, Best„nde Onnasch, Berlin and Bremen, 1992, p. 91 (illustrated in color). EXHIBITION Dsseldorf, Galerie Schmela, Meisterwerke des 20. Jahrhunderts, 1972, p. 30 (illustrated). Stuttgart, Wrttembergischer Kunstverein; Aachen, Neue Galerie, and Berlin, Akademie der Knste, Duane Hanson: erste Retrospektive des Amerikanischen Bildhauers, 1974-1975, p. 31, no. 10 (illustrated in color). 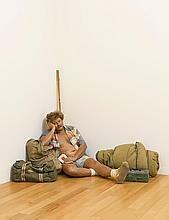 Humlebaek, Louisiana Museum, Duane Hanson, 1975, p. 7 (illustrated). Berlin, Nationalgalerie, Aspekte der 60er Jahre, February-April 1978, p. 33 (illustrated in color and on the cover). Duisberg, Lehmbruck Museum, Das Bild der Frau in der Plastik des 20.Jh, 1986, p. 157 (illustrated in color). Kunsthalle Tbingen/Kunstverein Tbingen; Josef-Haubrich-Kunsthalle K”ln; Kunstverein in Hamburg; Berlin, Haus am Waldsee; Neue Galerie der Stadt Linz; Wolfgang-Gurlitt-Museum and KunstHausWien, Duane Hanson Skulpturen, November 1990-April 1992, p. 53 (illustrated in color). Kunsthaus Zurich and Hamburger Kunsthalle, Hypermental: Wahnhafte Wirklichkeit von Salvador Dali bis Jeff Koons, 1950-2000, November 2000-May 2001, p. 59 (illustrated). Museu d'Art Contemporain de Barcelona and Museu Serralves, Museu d'Arte Contemporanea, Onnasch: Aspects of Contemporary Art, November 2001-February 2002, p. 203 (illustrated in color). Description: THE PHOTOGRAPHER polyvinyl, polychromed in oil, with accessories lifesize Executed in 1978 Provenance: Acquired from the artist Private Collection, New York Exhibited: New York, O. K. Harris Works of Art, Duane Hanson, 1980 Jacksonville Art Museum; Coral Gables, Lowe Art Museum; Orlando, Loch Haven Art Center; West Palm Beach, Norton Gallery of Art, Duane Hanson, 1980-1981 Wichita, Edward A. Ulrich Museum of Art; Auckland, New Zealand, Auckland City Art Gallery; Wellington, New Zealand, City Art Gallery; Christchurch, McDougall Art Gallery; Dunedin, New Zealand, Public Art Gallery; Hamilton, New Zealand, Waikato Museum of Art History, Real People: Life-like Sculptures by Duane Hanson, 1988-1989 Fukuoka, Japan, Working Art Wall Gallery at the Dada Building, The Heart of America, 1991, illustrated New York, Gallery Henoch, New York: City by Day/ City by Night III, 1992 Literature: Ann Bradley, "Duane Hanson....In the Flesh", Miami Herald, December 6, 1987, p. 10K, illustrated Kirk Varnedoe, Duane Hanson, New York, 1985, p. 86, illustrated in color. Description: Old Couple on a Bench autobody filler, fiberglass and mixed media with accessories lifesize Executed in 1994. PROVENANCE Acquired directly from the artist EXHIBITION Leipzig, Galerie fur Zeitgen”ssische Kunst, Weather Everything, August-October 1998 London, Royal Festival Hall, Duane Hanson on the Ballroom, December 1998-January 1999 Washington, Bellevue Art Museum, Duane Hanson, June-October 2001 NOTES Driven by the quest to maintain an honest contact to "real life", Hanson spent most of his professional career in South Florida, where the subjects of his works were everywhere and abundant. Rendered with tremendous empathy and familiarity, Hanson's figures are typically ordinary folks, with a special emphasis on the working class. They appear to lack style, self-consciousness and awareness that they are the subjects of a work of art. In Old Couple on a Bench, a man and woman, exemplify the clich‚ of Florida retirees. She is corpulent and overweight and dressed in loud clothing, he sports a sunburned, balding head and pale, white ankles. Though they are seated far apart and each is lost in thought, it is obvious they are a couple. As a signifier of the middle class, he is holding a JCPenny bag. While Hanson's works are regarded as classics of Pop and Photorealism, his work avoids the aloof, ironic stance of many of his peers, favoring instead, personal proximity and intimacy. Though clearly in tune with the prevailing trends in the artworld, Hanson was able to maintain an outsider's position. It was his insistence on not becoming enmeshed in the hubris of art centers like New York and Los Angeles that allowed his work to remain fresh and engaging. This outsider quality is exemplified in Old Couple on a Bench. Hanson captures the nuance of the couples personalities with their staunchly Middle-American values, his rendering is devoid of mockery. As is often the case, the artist who works independently comes to wield an enormous amount of influence on the thinking of future generations. Hanson's sculptures are a pre-cursor to such contemporary artists as Charles Ray, Ron Mueck, Jeff Koons and the Chapman Brothers. Each of these artists, in distinct ways, has come to understand new possibilites in realist sculpture due at least in part to Hanson's insistence on championing the everyday. Description: Old Woman in Folding Chair, 1976 & Vinyl, polychromed in oil, with accessories 46,1 x 22,0 x 359,8 inches (117.0 x 56.0 x 914,0cm) lower right Illustrated. Description: Polyester resin and Fiberglass, polychromed in oil, mixed media, with accessoriesExecuted in 1971, this work is unique. Description: Polyvinyl, polychromed in oil and mixed media with accessoriesExecuted in 1980, this work is unique. Description: Couple hyperrealiste engraving 30.7x22.9 in (78x58 cm) signed 90/110. Description: Old Man Playing Solitaire polyester and fiberglass polychromed with oil, clothes, glasses, glasses case, wrist watch, pipe, card table, chair, coffee mug, plate, matches and cards 50 x 35 x 55 in. (127.1 x 88.9 x 139.7 cm.) Executed in 1973. 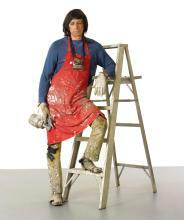 Description: Duane Hanson (1925-1996) Policeman autobody filler, fiberglass and paint with accessories 72 x 18 x 15 in. (183 x 45.5 x 38 cm.) Executed in 1993. This work is from a series of three variants. Description: Duane Hanson (1925-1996) Housepainter II bronze, polychromed with accessories overall: variablefigure: 71 x 27 x 18 in. (180.3 x 68.6 x 45.7 cm. )Executed in 1984. This work is number three from a series of three variants. Description: PROPERTY OF A DISTINGUISHED AMERICAN COLLECTION 1925 - 1996 BATON TWIRLER polyester resin and fiberglass, polychromed in oil and mixed media Overall: 88 1/2 by 36 by 40 in. 224.8 by 91.4 by 101.6 cm. Executed in 1971. Description: Holidays Collage 13.5x18.3 cm Signed, Dated. Description: Duane Hanson (1925-1996) Beagle in a Basket signed twice, numbered and dated '#4 DUANE HANSON SEPT. 1990' (on the underside) polychromed bronze and polyester cushion with acrylic filling, dog toys and basket 7 x 22 x 16 in. (17.8 x 55.9 x 40.6 cm.) Executed in 1990. Description: Man with Crutchsigned 'Duane Hanson' (on the cast)Polyvinyl polychromed in oil, clothes, crutches, paper cup and straw and chair52 x 25 1/2 x 48 in. (132 x 64.7 x 122 cm. )Executed in 1980. Description: Duane Hanson (1925-1996) Artist with Ladder polychromed polyester resin and fiberglass, mixed media, with accessories70 x 40.9 x 45 in. (177.8 x 104.1 x 114.3 cm.) Executed in 1972. Description: bronze polychromed in oil, found clothing, hair, duffel bag and sleeping bag, wooden sticks and paper tickets,Figure: 32 by 47 by 27 in. 81.3 by 119.4 by 68.8 cm.,Installation Dimensions Variable,Executed in 1985-87, this work is number 3 from an edition of 4. Description: DUANE HANSON 1925 - 1996 SECURITY GUARD bronze, polychromed in oil, mixed media, with accessories 70 1/2 by 30 by 22 in. 179.1 by 76.2 by 55.9 cm. Executed in 1990. Description: Lady With Shopping Bags polyester resin and fiberglass, polychromed in oil with accessories life-size Executed in 1972. PROVENANCE Collection Bo Alveryd, Sweden LITERATURE T. Osterwold, Duane Hanson, Stuttgart 1974, pp. 56-57 (illustrated) M. H. Bush, Duane Hanson, Kansas 1976, p. 54 (illustrated) K. Varnedoe, Duane Hanson, New York 1985, p. 52 (illustrated) M. H. Bush, Sculpture by Duane Hanson, Kansas 1985, pp. 64-65 (illustrated) M. Livingstone, Duane Hanson, The Saatchi Gallery 1997 R. Muir, "Type casts", The Independent Magazine, 5 April 1997 (illustrated on the cover) A. Searle, "It's the real thing. Not", The Guardian, 15 April 1997, p. 15 (illustrated) W. Feaver, "A woman of substance", The Observer, 20 April 1997, p. 10 (detail illustrated) T. Hilton, "Lady, you cannot be for real", The Independent on Sunday Magazine, 20 April 1997 B. Sewell, "Back to reality in a BIG way", Evening Standard, 1 May 1997, p. 29 EXHIBITION Wrttembergischer Kunstverein; Aachen, Neue Galerie; and Berlin, Akademie der Knste, Duane Hanson: erste Retrospektive des amerikanischen Bildhauers, 1974, p. 56 (illustrated) Wichita, Edwin A. Ulrich Museum of Art, Duane Hanson, October 1976, p. 54 (illustrated) Tallahassee, Florida State University Gallery, Duane Hanson: the new objectivity, February-March 1991, p. 32 (illustrated) London, Saatchi Gallery, Duane Hanson, April-July 1997, pl. 1 (illustrated) Grenoble, Centre National d'Art Contemporain de Grenoble, Dramatically Different, October 1997-February 1998 Dijon, Centre d'Art Contemporain, Duane Hanson, March-June 1998 Leipzig, Galerie fur Zeitgenssische Kunst, Weather Everything, August-October 1998 New York, The Whitney Museum of American Art, The American Century Art & Culture 1950-2000, September 1999-February 2000 London, The Saatchi Gallery, I Am a Camera, January-March 2001 NOTES 'It may be that in order to get to the heart of Hanson's ambition we need to re-contextualise his art historically, judging it not within the confines of photorealist painting to which it bears only a tangential and coincidental resemblance, but within 20th century figurative art as a whole. Like Alberto Giacometti in his attenuated reformulation of the human body in bronze, or Francis Bacon in his sleight-of-hand manipulations of paint into powerful evocations of flesh and physiognomy, Hanson sought above all to convey through his art an immediated and uncanny evocation of human beings. Most modern artists, from Picasso through to such great reinventors of the anatomy as Bacon and Giacometti, have sought to disentangle the sensation of a human presence from the mere recording of appearances, so as to confront us with that stripped-down sensation in all its elemental intensity, judging this to be the most direct path to a form of realism that could be felt in the bones and irradiated through the nervous system. Hanson's solution, by contrast, was to follow that initial visceral shock of recognition with a second jolt of astonishing surface resemblance. We are caught off-balance as surely as by a boxer's vicious right hook followed by an upper-cut in quick successionHanson's presentation of the work of art as a surrogate from reality, combined with his devotion to the human body in all its particularity as the form through which experience can be most vividly expressed both anticipated and influenced the work of much younger artists during the past decade. Charles Ray's pseudo-mannequins, Robert Gober's eerily lifelike desembodied body parts, the portraits in porcelain by Jeff Koons, the sexualized monsters created by Jake and Dinos Chapman, Abigail Lane's disturbingly naturalistic wax figures and the waxwork self-portrait of Gavin Turk as Sid Vicious are amongst the most striking of the many examples that could be simulationist tendencies and for art centered on the body. Although he seemed to take remarkably little notice of art-world fashions, preferring to focus entirely on the patient realization of his own project, it must have been both flattering and reassuring to him to witness so many instances of younger sculptors working in a mode so closely related to his own as to approach a form of homage.' (M. Livingstone, Like Life Itself, Duane Hanson, London 1997) Paying homage even further back art historically, on can look at the sculptor Pygmalion who carved an image of a woman, became enamored of her beauty and successfully entreated the gods to give life to the stone. The myth of sculpture's embodiment of its models - even where those models are creatures of fantasy - holds the promise of tangible fulfillment. Realized in 1972, Lady with Shopping Bags seems to capture this power; the power of ultra-realism that not merely mimics the visible but gives the most fierce possiblity of life to ideas, especially ideas that are disturbing and normally repressed. Through the infinite details of this sculpture, Duane Hanson is able to define behavior patterns and assigned value to the lower-middle class shopping American type: the "lady" of a certain age, dressed with everyday clothes identifying her class position, her two hands occupied with many bags. Yet the reality frozen into the sculpture is altered by its artistic transformation. The balanced relationship of Hanson to artistic criteria and reality illuminates and exposes an uneasy closeness. Indeed, the details such the woman's thick stockings falling on her plastic boots slightly opened, the intense expression in her eyes of fatigue mixed with loneliness have an aggressive effect, embarrassing, even strange, although these details are familiar. It is here where Hanson's talent is linked: Lady with Shopping Bags is not a merely extraordinary mimesis of a character, it leaves room for mass-consumerism criticism. Hanson admitted to exploring social issues in his work, illustrating the resignation, emptiness and loneliness of suburban existence. This love-hate reaction to American life allows the viewer to experience the duality which exists within; Hanson's work offers a taste of the hint of protest against the consumer-oriented society yet also reveals the artist's intrinsic belief in the specific and powerful energy that drives America. Description: The jogger, polyvinyl polychromed in oil accessories executed 1983-84 Sculpture (33x32x)32in. Description: Flea Market Vendor polychromed bronze, hair, sunglasses, fabric, pencil, magazine and metal folding chair lifesize Executed in 1990. PROVENANCE O.K. Harris, New York EXHIBITION Naussau County Museum of Art, Three Realist Sculptors: Segal, Hanson, de Andrea, September 1999-January 2000. Fort Lauderdale Museum of Art; Flint Institute of the Arts; New York, Whitney Museum of American Art; Memphis Brooks Museum of Art, Duane Hanson: A Survey of His Work from the '30's to the '90's, January 1998-June 1999, pp. 42-43, pl. 17 (another example of the edition illustrated and exhibited). 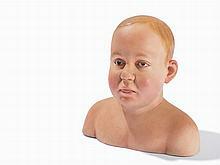 Description: Security Guard polychromed bronze with accessories lifesize Executed in 1990. PROVENANCE OK Harris Gallery, New York EXHIBITION Montreal, Mus‚e Des Beaux-Arts; and Modern Art Museum of Fort Worth, Duane Hanson, February-October 1994, p. 62 (illustrated) Dijon, Centre d'art Contemporain, Duane Hanson, March-June 1998 London, Royal Festival Hall, Hayward Gallery, Duane Hanson on the Ballroom, December 1998-January 1999 Palm Springs Desert Museum, Virtual Reality, September-December 2000, p. 54 (illustrated) Washington, Bellevue Art Museum, Duane Hanson, June-October 2001 NOTES "While Hanson is careful to preserve the purity of the idea of recreating, in sculptural form, the presence of a living, breathing human being, ultimately it is only as a concept that such direct parity between human source and sculptural object can be attained. Since the effect must be that of a miraculous, effortless and instantaneous apparition, it is irrelevant to the perception of his art that he has recourse to a great many of the techniques of traditional sculpture - piecing together, modelling, reworking, painting - beyond making moulds and pouring casts. There can be no sign of the struggle involved in bringing a figure into being." (M. Livingstone, Duane Hanson, New York 1997) Unsurpassed for their unnerving realism, Hanson tunes into the minds of his subjects so that each sculpture wears the physical and pyschological burden of life and everyday living. The overall impact is bittersweet-- the fun and cleverness of the illusion is married with a shared empathy for the character by both artist and viewer. Description: SUNBATHER STUDY I painted cast resin with accessories overall: 8 by 25 by 12 in. 20.3 by 63.5 by 30.5 cm. Executed in 1990. Provenance: Acquired directly from the artist. Description: Policeman autobody filler, fiberglass and paint with accessories 72 x 18 x 15 in. (183 x 45.5 x 38 cm.) Executed in 1993. This work is from a series of three variants. PROVENANCE Helander Gallery, Palm Beach. Description: Beagle in a basket, 1979 Sculpture 8x24x17 inches (20.3x61x42.5 cm) 3 ex. Description: Hanson Duane 1925 - 1996 USA Tourists, 1974 Silkscreen printed in colors. H 780 mm W 580 mm. 84/110. Signed. Description: Flea Market Ladypolychromed bronze, hair, glasses, fabric, magazines, books and metal folding chairlife sizeExecuted in 1990-1991. This work is number three from an edition of four variants. Description: Randers Artmuseum; "Amerikanske realister" 1973. 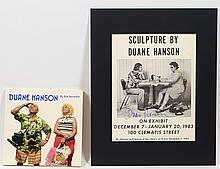 Signed and dedicated Best wishes, Duane Hanson 26 July 1974. Poster in colours. 84 x 60 cm. Description: Well-regarded American artist (1925-1996) best known for his highly precise, lifelike sculptures of 'ordinary' folk doing ordinary things. Color postcard featuring Hanson's work entitled Man with Crutch 1979, signed at the bottom in black ballpoint, "Duane Hanson." On the reverse, Hanson has added a brief ALS, dated February 19, 1981, which reads, "Dear Mike Willey, thank you for your letter. Very best regards. Duane Hanson." In fine condition.